My first major influence was, and still is The Beatles. Paul McCartney is an outstanding bass player and has probably influenced more bass players than any other person. If you listen to The Beatles tracks in chronological order, you can hear his bass playing mature with each successive album. Lovely Rita (from Sgt. Pepper). Another of my favourite bass players has to be Geddy Lee of Rush. Some of the bass lines that this guy comes up with are absolutely incredible and the fact that he sings at the same time is mind-boggling. Closer To The Heart (from A Farewell To Kings). La Villa Strangiato (from Hemispheres). Although I've listened to The Who for many years, I've never really bothered playing any of their tracks until quite recently. John Entwistle was an astounding player with a unique sound. He was also something of a collector as shown in the book "Bass Culture" which is well worth looking out for. One thing that I have noticed with Entwistle is that he rarely plays the same thing twice, his live versions are totally different to the studio versions so when listening to a Who track, you can be sure that there is no definitive version as far as the bass lines go. My Generation (possibly the first recorded bass "solo"). Chris Squire of Yes is a phenomenal bass player although the music of Yes can take a bit of getting used to. 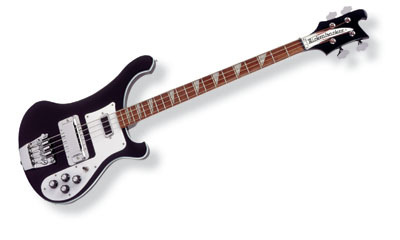 Chris was probably the first player to exploit that "cranked up" sound of the Rickenbacker 4001S although he did modify it slightly so that it had a stereo output which he used to drive 2 amps. Yessongs, in particular The Fish which is a stunning bass solo. Bruce Foxton of The Jam is another Rickenbacker user and some of his bass lines are very melodic with that Rickenbacker sound nicely filling out the sound of The Jam, a 3-piece band. John Paul Jones of Led Zeppelin is a multi-instrumentalist who has played bass on many hit records whilst working as a session musician. At one time he was very under-rated but these days he is considered to be one of the best. Anything on the live album - The Song Remains The Same.